For she made, ella hace this month, Leslie and I are showcasing sweet potatoes! It's that time of year when I just can't seem to get enough of them. I think my favorite thing is probably just a simple baked sweet potato with blue cheese, bacon, a few candied pecans, and some chives. I could probably eat that on a daily basis. 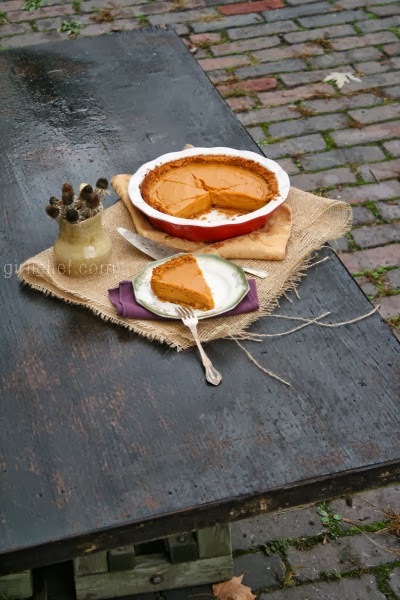 But today, I wanted to combine sweet potatoes with something else that is inevitably on my mind this time of year - PIE! It's true, once the leaves begin to change colors, and that nip is in the air, the Thanksgiving-menu-gears of my mind start clanking to life. It's my favorite meal of the year, and I start the planning early. It's time for me to begin testing pies and side dishes; time to start gathering magazines and books. It makes me happy. 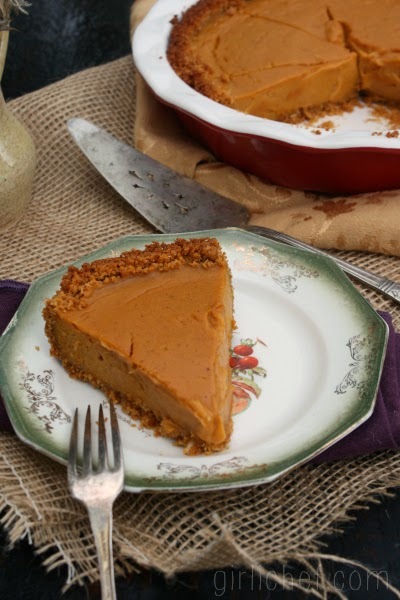 I have made sweet potato pie in the past, but I wanted one with a different spin this go-round. 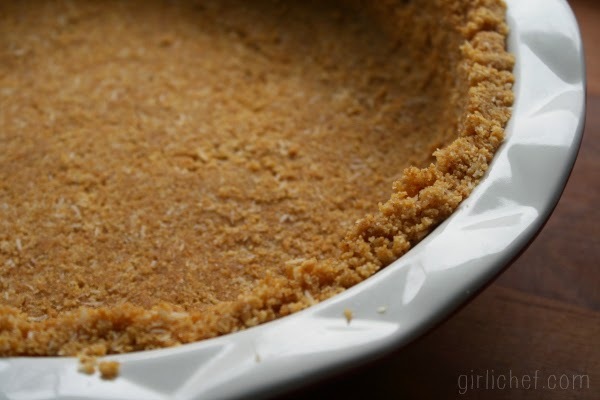 I've always used a "regular" crust, this time I went with graham cracker; I love the way its sandy texture and brown sugar-flavor complement the custardy, coconut and sweet potato center. Will this make the "final cut" (aka the Thanksgiving menu)? Perhaps, but I still have so many more to test! Place the sweet potatoes into a medium saucepan, and cover with water by an inch. Bring to a boil, then reduce heat and simmer until tender, 12-15 minutes. Drain and let sit in colander for a couple of minutes. While the sweet potatoes are cooking, melt the butter in a medium-sized glass bowl. Add the remaining crust ingredients, and stir with a fork until well combined (it should look like wet sand). Dump into a 9-inch pie plate and press the mixture into the bottom and up the sides. I like to use the bottom and edges of a measuring cup to help press it in evenly. Slide into preheated oven and bake for 7 minutes. Carefully remove and set aside while you're finishing up the filling. 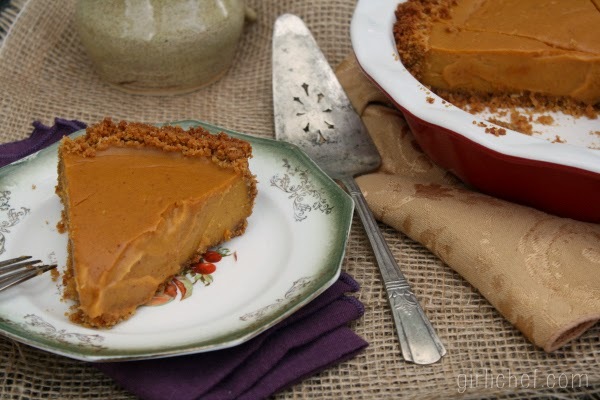 Place the sweet potatoes into a food process (or powerful blender) along with the remaining pie ingredients and blend until smooth. Note: if the potatoes are still pretty hot, don't add the eggs until you've blended everything else smoothly, to help cool them down a bit, then blend again. 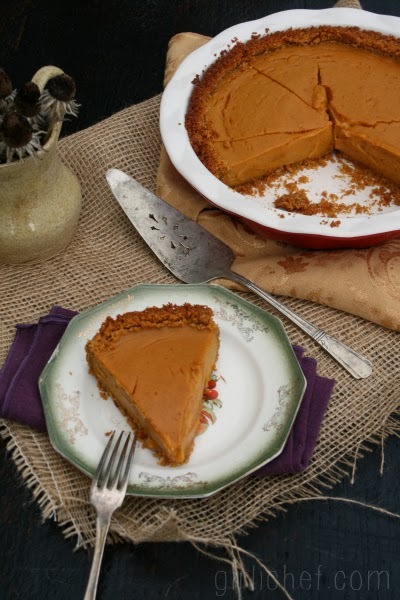 Set the pie plate and par-baked crust onto a baking sheet, then carefully pour the sweet potato mixture into the crust. Place the whole thing back into the oven and bake until the pie is set, but not dried out, 40-45 minutes. Set the pie on a wire rack to cool. Serve warm or at room temperature.